Slime paint! Combining kids’ science and art is a favorite pastime of mine. I also enjoy creating ‘famous artist’ activities (probably from too many years of teaching children’s museum art classes). So, when I started making slime all of the time (even my 13-year-old son enjoyed it, and anything that takes him away from the Xbox is a-ok in my world) I wanted to do something a bit more artistic with it. In the past I’ve painting with shaving cream, clay and textured finger paint. For this one, we took the famous artist theme and re-created Monet’s Water Lilies – in slime! I tried a few different recipes that failed in majorly miserable ways. The first ended up looking something like wiggly string floating in water, the second was basically putty and the third was a bit too jello-like. I’m not saying that I’ve perfected the recipe, but I did finally get a consistency that worked as a finger paint. By adding more (and some more) glue, I eventually got a slimy paint that could spread, but also spread apart into fringy strings (like a spider web). When you try this with your child, encourage him to experiment with the amounts. Trying to make different consistencies is half the fun of this activity. 1. Combine the glue and water. We used ½ cup of water and roughly 1 ½ cups of glue. You can change the quantities, but try to keep the water-to-glue ration at 1:3. 2. Measure and mix in ½ cup of liquid starch. 3. Separate the slime. I chose to use cupcake tins. They have the perfect size of compartments. 4. Drop a few drips of food coloring into each compartment. Mix it thoroughly. You can add a few drops of water as well. This makes it easier to mix the colors. 5. Spread the slime onto the paper. It kind of looks like melty cheese or something that came out of an alien's nose (i.e., it's not pretty). But, it sure is fun! Your child doesn’t have to create a Monet painting with the slimy stuff. He can make an abstract work of art or whatever design he imagines! Oh this is such a great activity for kids! 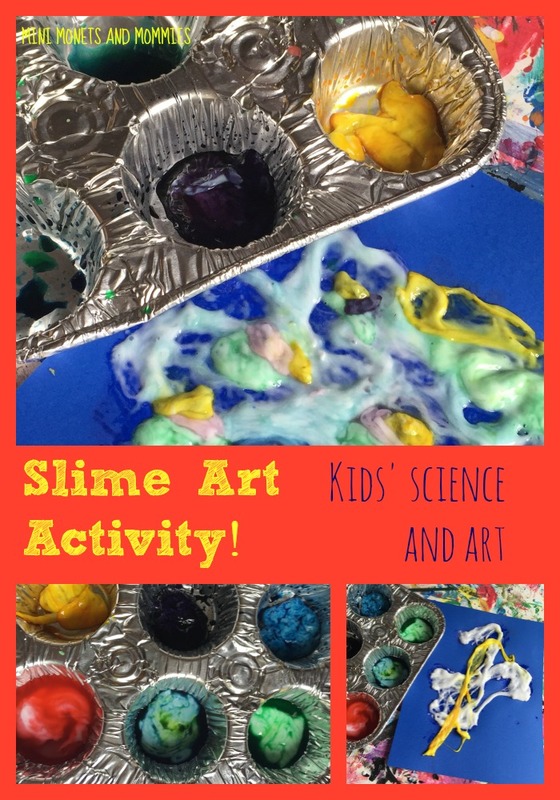 Slime and paint - oh, this one would go over really well at my house! 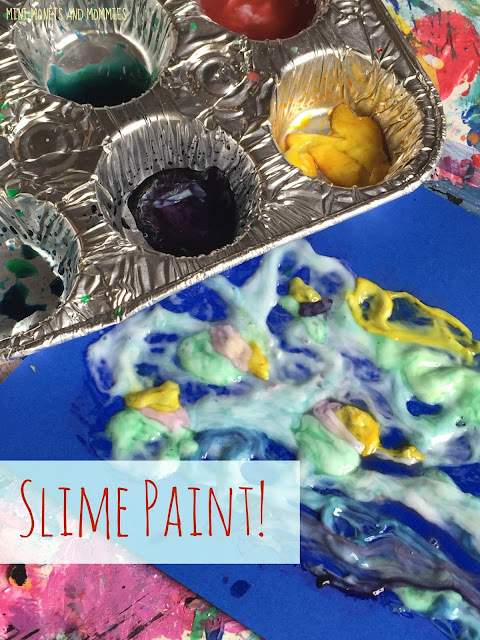 We love slime and paint at my house, this is the prefect way to put them together. I love the idea I simply have to try it, it's bound to be amazing. Thanks for sharing.